The innovative Titan Express laser cutting machine, of the Titan Series, gives lean manufacturing the agility and responsiveness never before seen in a size that fits your facility and budget. 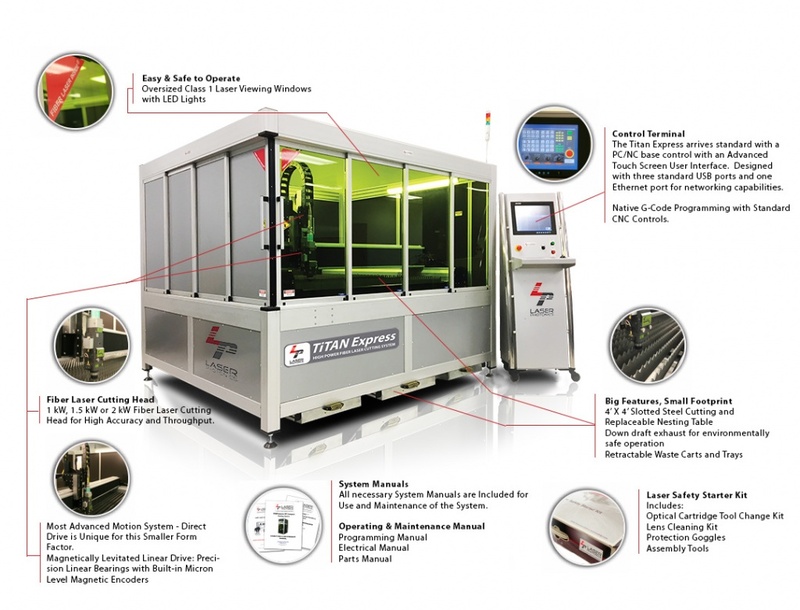 The Titan Express combines the cutting edge in motion engineering, CNC control and fiber laser technologies into a size that is unique to the industry. Titan Express is equipped with a high-power, energy efficient fiber laser and an advanced direct drive motion control platform – making it the best machine for cutting highly reflective materials (including stainless steel, aluminum, brass, and copper). Titan Express has a light weight design and the fastest cutting speed on the market. This system features reduced energy consumption and 1/3 of the operating costs of other laser machines. The Titan Express’ fully software-controlled geometry alignment eliminates the need for special installation requirements. The Titan Express requires no optical system alignment, laser service or laser replacement parts making this system virtually maintenance free. Direct Drive Motion System—the cutting head moves with the highest possible acceleration and smoothness, reducing stress and vibration on the carriage frame and lowering maintenance requirements. Manufacturers which cut highly-reflective metals and without a lot of floor space will particularly benefit from the Titan Express, particularly producers of construction equipment, aluminum vehicles, kitchenware, copper and brass gaskets, food processing equipment of any kind, and materials used in the aerospace and defense industries. The Titan Express consumes less than 5% of the power required by a CO2 laser system with the same output wattage. The Titan Express’ laser provides the highest possible accuracy and repeatability, resulting in the smallest possible penetration point and the finest edge control. Users can increase their laser cutting power of 1kW,1.5kW, or 2kW. No need to remove the system from the production line. The Laser Photonics laser auto focuses while in operation, adapting its focal point dynamically to account for changes in the thickness of the material being processed. The beam produced is highly precise and slim, lower than 0.1 mm. This eliminates the discoloration on either side of the cut caused by conventional laser cutting methods; delivering the lowest Heat Affected Zone (HAZ) available. This is ideal for all highly-reflective metals 1” thick or less. CleanCut technology eliminates burns around corner areas caused by the laser during cutting. This provides a perfect cut and the highest quality edges possible, and is particularly effective on highly-reflective materials including aluminum, copper, bronze and steel. Simple Beam Delivery—The Titan Express uses fiber optic beam delivery, a state-of-the-art technology ensuring the most consistent beam path. Conventional laser cutting methods are complicated, using articulated arms and CNC beam length compensation and requiring constant aligning of the optics. This results in different cutting qualities in different areas of the work table. Laser Photonics’ fiber optic beam delivery contains no moving parts in the beam path, guaranteeing consistent cutting conditions over the entire work area. TurboPiercing technology—a standard on all Titan Series systems, TurboPiercing guarantees the fastest and most consistent piercing speeds available. Unlike conventional methods, TurboPiercing technology creates an accurate hole, avoiding unnecessary craters in the material. Plasma Shield technology—When transitioning from straight line cuts to corner cuts, Plasma Shield technology precisely restricts plasma generation. 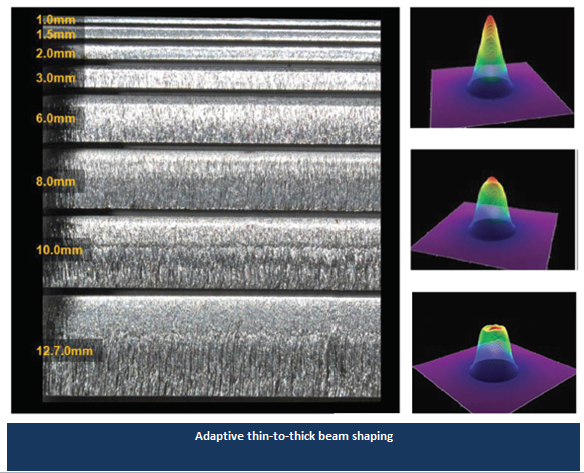 Conventional CO2 lasers cut a deformed edge while maneuvering corners, resulting in an inferior cut quality and minimizing production acceptance. Laser Photonics’ Plasma Shield technology tightly regulates acceleration speed, controlling plasma generation while maintaining superior quality and production throughput. The Titan’s bridge and motion unit is extremely light-weight, aiding its cutting velocity and acceleration. The Titan Express incorporates a zero-friction motion system to float its laser effortlessly across the working surface area. Not to be confused with flying optics technology that incorporate belts, pulleys, and ball-screws, frictionless direct drive motion system technology is magnetic-based, requiring no maintenance. The material positioning functions of the Titan Express are impervious to shock and vibration, increasing long-term reliability with no positioning error, and require no maintenance. Material in process will remain in alignment. Users can recalibrate the gantry instantly, ensuring the material is always in alignment, free of seizures and unplanned machine failures. Built to perform flawlessly in harsh industrial environments, the TitanExpress design includes a reduced floorspace footprint and lower overall power consumption.